Note: Visitors to WYC should use the directions here. Following your SatNav to the club postal address may result in you driving up a narrow, dead end, one way street! 01/06/2019 B14 Open B14 Open 2019, 1st and 2nd June. Contact Mark Barnes for more information. 15/06/2019 Wanderer Open Wanderer Open - 15th & 16th June 2018. Racing on the Saturday, Cruise on the Sunday! Notice of Race, Entry Form. 22/06/2019 Merlin Rocket and Tasar Open Merlin Rocket and Tasar Open 2018, 22nd and 23rd June. 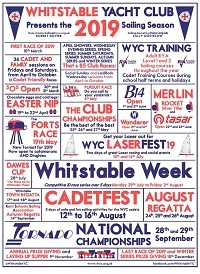 14/07/2019 WYC LaserFest’19 Two days of great Laser racing and social events at WYC on 13th&14th July as part of the East Kent LaserFest series. 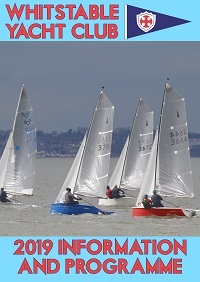 14/09/2019 KSSA Regatta The Kent Schools Sailing Association's Annual Regatta, this year at Whitstable Yacht Club. 28/09/2019 Tornado Nationals 2019 The Tornado Nationals 2019 at Whitstable Yacht Club! 28th and 29th September.